Isla Mujures is an island off of the coast of Cancun, in the Caribbean Sea. It’s just a short 20-minute ferry ride from Cancun. The quaint island is about 7 kilometers (4.3 mi) long and 650 meters (2,130 ft) wide. This exceptional island is known for it’s natural beauty and cultural history. 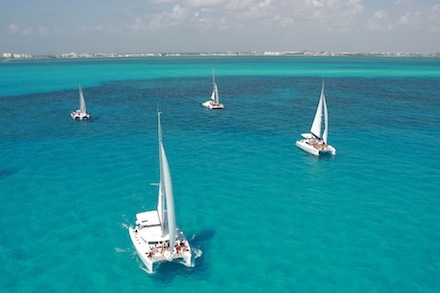 Cancun Great Vacations offers a day tour to Isla Mujures, which starts off by hopping aboard a double decker catamaran and sailing towards the picturesque island. Once you arrive, you can spend the day as you please. You have access to the island’s exclusive private beach club, where you can swim, snorkel, or just relax on the beach! You can take a stroll into town and learn more about the history of the island. Or check out the cute shops for souvenirs.This tour includes return trip transportation on a catamaran, private beach access, activities, cultural tour, buffet lunch, open bar, and lots of entertainment! Looking for something a little more thrill seeking to do? How about a speedboat tour? This exhilarating excursion gives you a tour of Nichupte Lagoon, brings you through mangrove forests, and an exciting speed ride along the Caribbean Sea to Punta Nizuc National Park. At the park, you can snorkel along the second largest coral reef in the world, the great Mesoamerican Barrier Reef. You can jump off the boat to explore the beautiful tropical plants, exotic birds, and natural wildlife in the park. A bilingual tour guide will be there to answer any questions you may have. 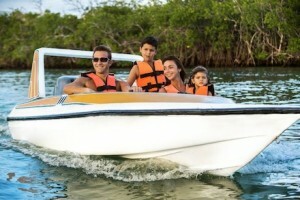 This excursion is one of the most popular in Cancun. This experience is definitely well worth leaving the resort for! Beverages are included. Ahoy! All aboard Captain Hook’s pirate ship! Venture into the Caribbean Sea on board this exciting and authentic galleon to experience the most exciting dinner cruise in Cancun. This fantastic boat cruise and night tour is a timeless activity that provides endless fun for the whole family. This attraction includes a delicious dinner buffet, and open (domestic) bar, with air conditioning in the dining areas. The pirate show is beyond entertaining but don’t worry, you won’t have to walk the plank! There are also games and contests in a festive atmosphere that include old pirate legends, sword fighting scenes, and exciting music. Don’t be surprised if by the end of the night you are talking like a pirate! Shiver me timbers, mate!